‘HESPR @30+’ as IHBC’s heritage business listing passes 30! HESPR, the IHBC’s heritage business listing formally recognised by lead heritage such as Historic England, is the institute’s promotional and quality assurance service for businesses that work to conservation and service standards expected by the institute, and recent new arrivals to the listing brings the total past 30! 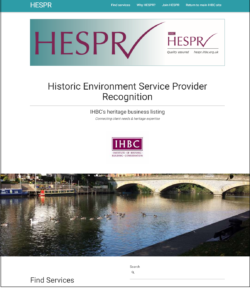 The IHBC’s HESPR – or ‘Historic Environment Service Provider Recognition’ – scheme, connects potential clients with authoritative conservation businesses and their expert advice. View the list of IHBC conservation accredited practitioners. This also may be searched for DSA members in HESPR businesses.